I saw this quote in a book about writing, but it struck a chord with me. It relates to so many things in life, including making peace with a life with out children. 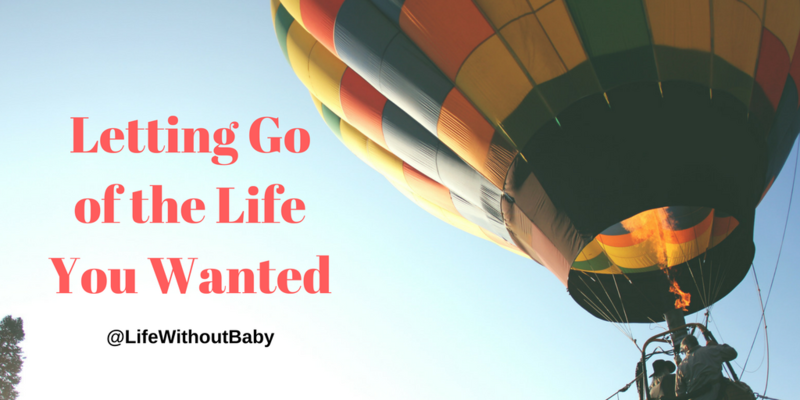 One of the hardest stretches of my journey was the space between realizing that our options for building a family were running out, and the point where we made the decision to stop trying. I knew there were options still open, but they were beyond the scope of what Mr. Fab and I were willing to do. At some point we had to make a decision that we would not have children and that we would find a way to be okay with that. It was one of the hardest (and perhaps longest) decisions I’ve ever had to make. I’m sure you’ve found yourself in this kind of situation in other areas of life, too. You know that you have to take a new direction, that ultimately it will be the right decision, but as France says, in order to do that, we have to leave a part of ourselves behind. Sometime the hardest part is listening to ourselves and not being afraid to make the wrong choice. My first career was in engineering. I’ve made several career changes since then, trying to find the place in the world where I’d be happy. I’ve found it in writing, but it took me a long time to get here. Many people can’t understand why, after all those years of college and graduate school, I would abandon a perfectly good and respectable career. I’ll be the first to admit that if I’d just stuck to engineering, I would probably have been more “successful” and definitely would be making more money, maybe own a home and live comfortably, but I know I wouldn’t have been happy. I might have been successful by the conventional definition, but the cost of sticking to a career that didn’t make me happy, just because it’s what was expected of me, didn’t make any sense. But it wasn’t easy to let go of that life and take a risk of finding happiness in another life. Part of finding happiness is letting go of that which doesn’t make us happy. Although I believed that having children would make me happy, I was miserably unhappy running in circles trying to produce a baby that my body had no interest in creating. I could have gone on trying forever, but the cost to my mental and physical wellbeing would have been enormous. Letting go of that part of my life enabled me to find peace with my new life, even if it’s a life I wasn’t sure I wanted. Lisa, your comment “I was miserably unhappy running in circles trying to produce a baby that my body had no interest in creating” really struck a chord with me. I think I have always felt somewhat embarrassed, not responsible necessarily but kind of unworthy because I couldn’t produce a living, viable baby. But the comment that your body, and because of my infertility, my body had no interest in creating that baby somehow just made me feel better. In fact I think I’ll use it as a response when people ask me why I don’t have children. That is if I feel a response is necessary. In fact letting go of that part of my life did make me happier overall. There will always be some events or comments by others that remind me of that loss but I don’t regret my decision to get off of the treadmill of infertility procedures that didn’t work. And like you I adjusted my life and career to do things that make me happy. Challenging sometimes but overall quite rewarding. I appreciate your weekly comments Thank you for all that you do. I did love that same comment about my body not being able to produce a baby. That is the truth, not that everybody is worthy of hearing that truth. Some days I am all for educating the public about infertility other times not so much. But letting go of the life I wanted has been difficult, but 7 years later, most of the time I don’t think about it , in my day to day living. Another thing, that encouraged me was when Kathy Guthrie. Said a woman was telling her story and matter of fact about not being able to have kids and continued with her story struck me. Like Lisa wrote , I due believe there was maybe even some shame but definitely embarrassment about my bodies ability to reproduce. At times I still a bit of I should be doing something overachieving since I don’t have kids, and maybe something g will come to me to do. But what I have learned is being a real authentic , genuineperson and showing up in my life is the best thing I can do for a me. Thanks for the gift of this tribe and your strength Lisa to write about your experiences so I was not so isolated with this experience.